Greg Rucka’s 2003 – 2006 run of Wonder Woman continues his excellent portrayal of strong women characters, a lineage that incorporates Carrie Stetko in Whiteout and Tara Chace in Queen and Country. Later, Rucka would tackle Batwoman and the new Question, Renee Montoya. 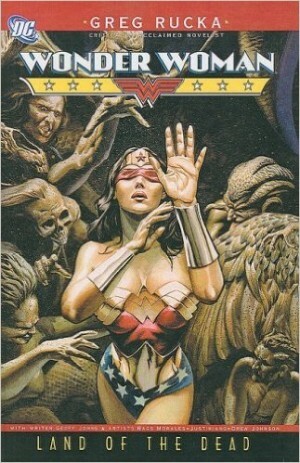 It made sense for novelist Rucka to write Wonder Woman. Not only is he a fan, but his fresh approach focused on what Wonder Woman thinks or does, while also displaying how she is perceived and received by others. 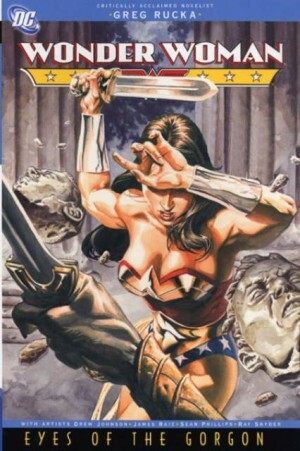 Rucka has said that writing Wonder Woman was “murderous”, so he opted to show how people see her. This first story arc deals with Wonder Woman, as an ambassador of Themyscira (Paradise Island), having opened a mission along Embassy Row in Washington DC. To spread her message of peace to the world she has written a book about her mission and beliefs. This five chapter story details how her friends and foes (old and new) respond to the book. 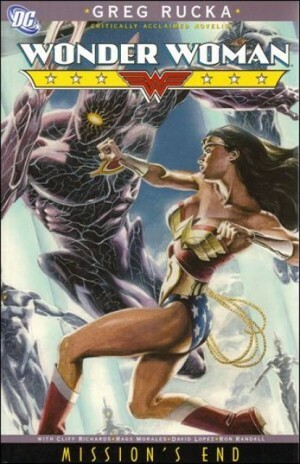 Rucka draws directly from the foundation built by George Pérez in his mid-1980s run of Wonder Woman. The Amazon princess has dispensed with having a secret identity and faces issues confronting any public figure – slanders, media hounding, and the pressure of putting yourself out there in full view of the world. What is satisfying about this series is not only that Rucka fulfills the action quota (there are team-ups with the Flash and fights against villains like the Silver Swan), he takes the time to explore ideas about gender, justice, the media and international diplomacy. 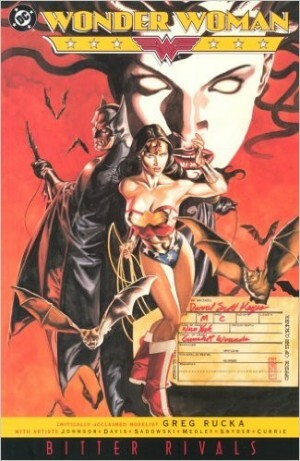 Down to Earth was more ‘talky’ to set the context of Wonder Woman as an ambassador, but by the final chapter Rucka found the balance between ideas and action. He knows his Greek myths well, and made it a point to feature the Olympian gods and goddess in the story. 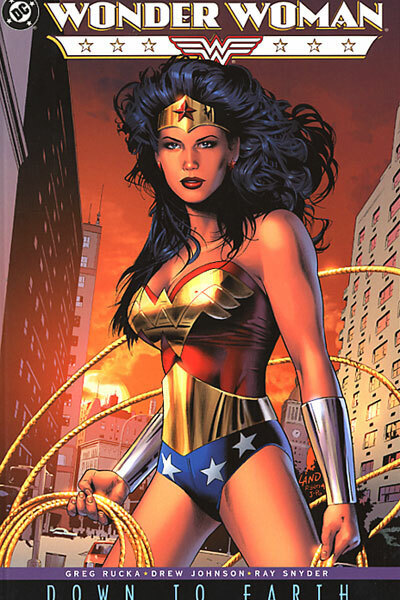 Two main themes that ran throughout Rucka’s Wonder Woman are media manipulation and political manoeuvring. 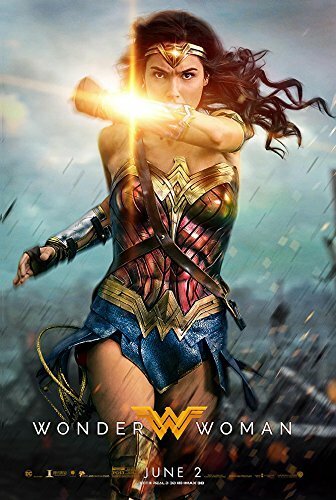 Wonder Woman’s most powerful enemies were not super-villains or Greek legend monsters, but those who seek to destroy her reputation and spirit by the common means of disinformation and distortion. Down to Earth is a good start to an excellent Wonder Woman run, which continues with Bitter Rivals. The art is handled ably by Drew Johnson, and the book also reproduces excellent covers from the original comics by Adam Hughes, Steve Rude, Greg Land, Eduardo Risso and Phil Noto. 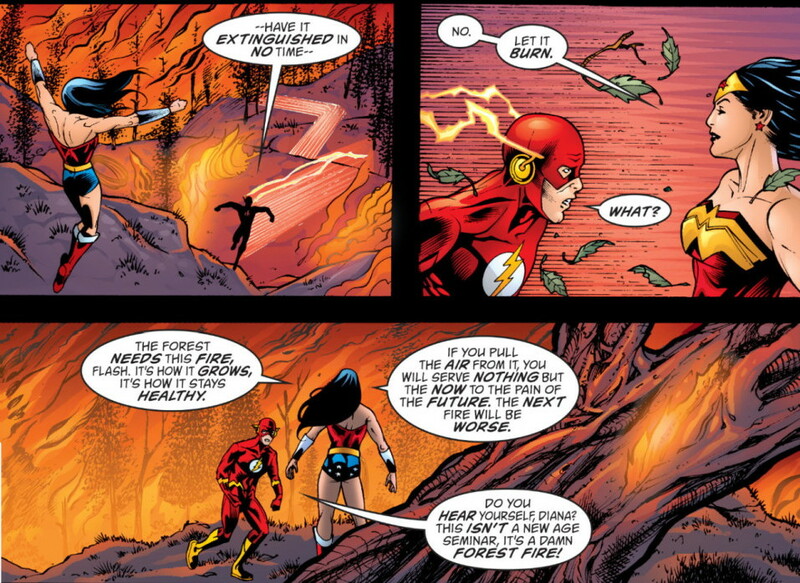 Johnson’s art may not have the fluidity of George Pérez or Phil Jimenez (the Wonder Woman artist just before this run), but he is able to handle the emotional scenes required in Rucka’s script. An inspired extra is the presentation of media coverage of the book written by Wonder Woman, drawn by Eric Shanower, the writer/artist of the Age of Bronze, which deals with the Trojan War.